T25 finisher Bob Kittredge says of Ice Gulch Path, "Very scenic. I like to do this in the counterclockwise direction. Lots of boulders to scramble over and crevices to slip into." Other hikers have compared this path to King Ravine's Subway (only longer and more vertical). 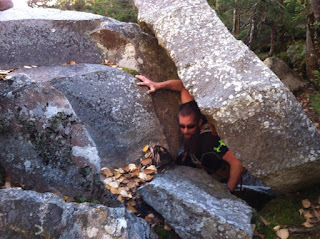 The White Mountain Guide states, "The trip through the gulch itself is one of the most difficult and strenuous trail segments in the White Mountains, involving nearly constant scrambling over wet, slippery rocks, with deep holes between them." The Ice Gulch section of this path is 0.9 miles long with 700 feet of elevation gain.